Kawartha Arts Network (KAN) has been in existence for 11 years, starting out in 2008 as The Arts Department. The initial vision came from Andrea Percy, Charles Cooper, CJ Irwin, Michael Hughes and Anders Widjedal. Local artists were excited to participate in an organization that provided the chance to exhibit their work year round, plus make much-needed connections with others in a variety of Visual Arts fields. The Victoria County Historical Society continues to embrace the possibilities afforded by ongoing community outreach and collaboration, which were evident in three significant projects undertaken by the VCHS this past autumn. Starting out in fashion, selling children’s apparel and driving a taxi, in 1976 Penni Holdham enrolled at Ontario College of Art, where she explored jewellery making, photography, sculpture and painting. Following graduation and a short stint as a ski bum, she worked for a Singles Dating Club in 1980. Social planning for singles led her to special events design and production. Here, she found a challenging career path offering a new creative opportunity every day. Paint! Dance! Sing! Everyone is an Artist. Have you ever mindlessly doodled, scribbled or made vigorous circles, lines on paper? I have. The desire to draw comes naturally. Give a toddler a crayon and they will instinctively start to scribble! As we grow, the act of art making progresses from a flurry of ‘meaningless’ scribbles to images and words that make order of our world. In short, drawing and other forms of art are simply part of our instinct to communicate and express ourselves. Congratulations to Mayor Andy Letham and Councillors Yeo, Seymour-Fagan, Elmslie, Veale, Dunn, Ashmore, O’Reilly and Richardson on their successful election to Council. Kawartha Lakes Arts Council and the Kawartha Lakes Heritage Network look forward to working with Council to further strengthen cultural tourism and economic development in the Municipality. In 2014, a coalition of artists and organizations formed Kawartha ArtsVote to bring awareness to the cultural sector in advance of the 2014 municipal election. In the lead up to the 2018 municipal election this October, they are re-launching ArtsVote, working with Kawartha Lakes Heritage Network, and shining the light on the cultural sector once again. A coalition of artists and related organizations have relaunched ArtsVote for the 2018 municipal election to once again shine the light on the cultural sector. A gift from an anonymous donor will be used by the Cultural Centre Committee to look into potential of creating a cultural hub in Kawartha Lakes. A recent interview with Ray Marshall after he joined us on the Kawartha Lakes Arts Council. Why is the arts council important to you to join and give your time? The arts council is very important to me as I have a desire to contribute to the community in the City of Kawartha Lakes. I really appreciate the work that has taken place, and staying 'in touch' with fellow members of the City who engage, work, and celebrate the Arts . Are the Kawartha Lakes part of your personal history or have you had a longer connection? My first real work experience in the art world was being involved in the Kawartha Summer Theatre at the Academy Theatre in Lindsay, as a lighting and sound technician. I spent eight summers there involved in all aspects of the theatre. In 1985, I became the Academy Theatre Manager until 2006. It was a very important time for me to be in Lindsay and enjoy family life and it formed the basis of my very interesting and rewarding career. Where did you grow up and spend your youth? I grew up in Stouffville, Ontario and was involved with drama all throughout high school and also enjoyed four years playing in a rock band. I played the drums, and did some vocals. It was great fun ! What were the strongest cultural influences on you growing up? Bill Glassco, (from Tarragon Theatre in Toronto ) Dennis Sweeting, ( Kawartha Summer Theatre.) were my two mentors when I was a young” techie''. They were important to me because of their Canadian Artistic Vision, their ability to do quality plays for their audiences, organizational skills, always respectful to their actors, designers, writers and staff. What do you believe, is your “genius” the one thing that you do the best and are proud of? I am proud of working in a “live theatre” of day to day experiences. I know I have strengths in connecting and working with people involved with all aspects of live theatre in the performance arena. I am able to connect with the audience, performers, the crew, volunteers as well as board members and supporters in my community. What do you believe is the role of an Arts Council in a community? I believe that an Arts Council needs to be active and play a significant role in the community. This can be in support of a major project or bringing artists together to showcase their work and gain prominence in the community. It is also serves to develop a membership base that will have an impact and offer a focus for the community both economically and philosophically. It is important for the Council to encourage and communicate with all age of artists in as many disciplines as possible. Lyndsey Friesen is the new program coordinator of the Kawartha Lakes Arts and Heritage Trail. She graduated from Trent University with a Bachelor of Arts in History, and went on to complete a Post Graduate Certificate in Museum Management & Curatorship at Fleming College. She had her start in museums and the cultural sector spending springs and summers in Algonquin Provincial Park working at the internationally renowned Visitor Centre and Logging Museum. Lyndsey interned at the London Heritage Council, offering expertise to standardize the City's records management for collections and public art, and coordinated public history initiatives and natural heritage programming such as the event Trails Open London. Lyndsey has a wealth of experience in the local community and beyond, from volunteering at the Canadian Canoe Museum, to working as an interpreter at Lang Pioneer Village. Lyndsey began work at the Victoria County Historical Society in 2015 to join the special project First World War Comes to Life, and as Project Manager of this living history travelling event, she secured ongoing federal funding, sponsorship, national partnerships, and was responsible for the creation of exhibition displays and the interpretive program. On Friday, September 29, 2017, LAURIE SCOTT, MPP, for Haliburton-Kawartha Lakes-Brock, will be at Kawartha Settlers’ Village, to announce the new Program Coordinator for the CKL Arts & Heritage Trail. The Program Coordinator, working collaboratively with the 24 heritage sites, cultural organizations and artists on the Trail, will promote cultural tourism across the Municipality. The Ontario Trillium Foundation, an agency of the Government of Ontario has announced its most recent round of grant recipients. The grants will provide funding for 204 community projects across the province including 11 in the Kawarthas. 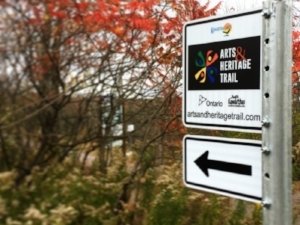 The Kawartha Lakes Arts Council is very happy to announce that our organization has received a $63,900 grant over 12 months to hire a coordinator to develop collaborative programming for the Kawartha Lakes Arts and Heritage Trail. We are very excited about this opportunity to further strengthen our Arts and Heritage network in the City of Kawartha Lakes.